Here we are then, episode nine, the traditional Game Of Thrones cup final. To date, the penultimate episode of each season has seen Ned's execution, the Battle of the Blackwater and the Red wedding. How will The Watchers On The Wall compare? The short answer is pretty bloody well. We've been building to the Wildling assault on Castle Black for an age, and in the event it didn't disappoint. High stakes, derring do and real emotional heft made this much more than an extended fight scene. Things start up slowly, with Ygritte and Gilly giving us two versions of the same story. Both are Wildings in love with Crows, but while one has murder on her mind the other seeks sanctuary. It's a neat summary of the entire Wilding position, really – Mance must attack and overwhelm the wall, but only so that he can use it to protect his people. After all, you need to be pretty desperate to attack a 700ft wall. Desperate, brave and in possession of giants. Giants always help. Especially when you've got a plan – and Mance has a whopper. The attack itself is a crash course in long-term planning, Free Folk style, with Mance's forces attacking from the north while Tormund and Ygritte's merry band of northern nutjobs surprise the Night's Watch from the south. Castle Black comes under attack – from both sides of the Wall. For a while, it works rather well. There's a real sense of desperation throughout the fighting, as the tiny band of Brothers attempt to hold back the flood. It's here, as Tormund's raiders overrun the walls of Castle Black, that the action is at its most bluntly traumatic. Arrows slash throats, hammers slam into heads – it's really everything we've come to expect from a good old fashioned Westerosi scrap. That it's all shot against the fire-lit night gives the whole thing a nightmarish quality, as if Castle Black has become a very specific part of the seven hells. The dual attacks keep the action moving, and there's a panicked, restless quality to the camerawork. Wall-side we're treated to some excellent visuals, from the brilliantly realised giants to the scythe that turns the ice red as it slashes through Mance's climbers. As ever, the Game Of Thrones "creative deaths" department is on top form, keeping us on our toes throughout an episode that could easily have become bogged down in all the bloodletting. And yet for all the deaths littered throughout the episode, the one that hits hardest is Ygritte. Rose Leslie has put in a superb performance as the flame-haired Wildling with the killer catchphrase, making her a fan favourite over the last couple of seasons. In reality, Ygritte was always doomed. No son of Ned Stark was ever really going to forsake his vows and run off into the north with a Wildling woman, but it's testament to the strength of Ygritte's character that we all sort of wished he would. 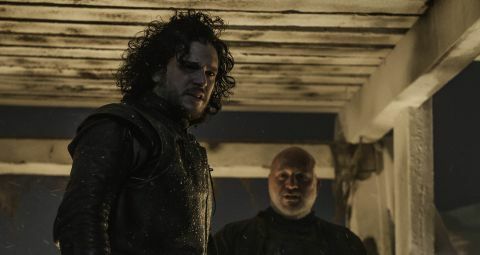 With the death of Ygritte, Jon's path is now all too clear. His leadership is the deciding factor during the battle, and with the Watch decimated he seems the clear candidate for Commander. He's obviously capable of making the tough decisions – you need only look to Grenn's death match with the giant in the tunnel for proof of that – and somebody has to guard the realms of men. For more on top TV shows like Game Of Thrones, subscribe to SFX.